Another Heller Mirage V kit was made in a similar fashion as the earlier made kit. 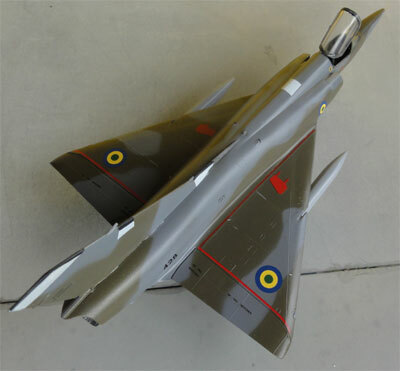 It was finished in a scheme for a "Force Aerienne Gabonaise" ( Gabon air Force ) Mirage 5G, the G standing for Gabon Export Model. 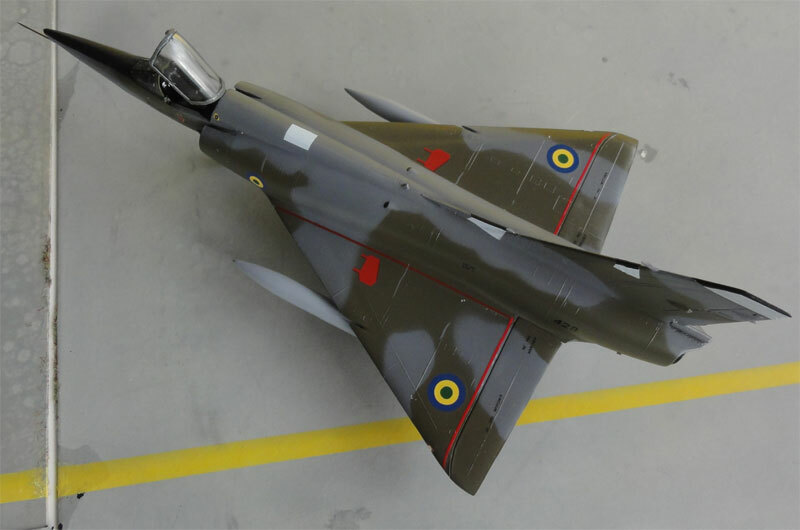 A profile drawing is seen in the book Mirage III Planes and pilots on page 46 with a camouflage scheme. These were applied with the airbrush. 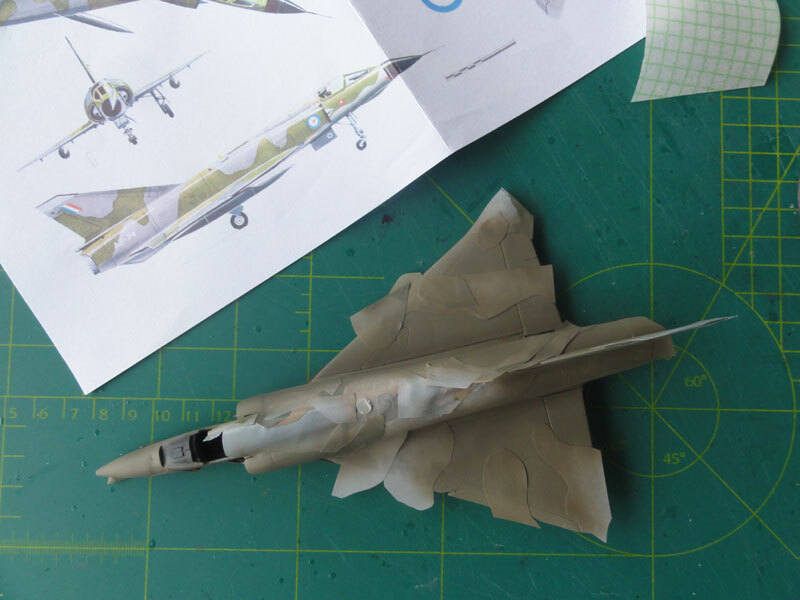 It has a similar camouflage pattern as most Mirages, using the French pattern layout. Masking was done also with low tack masking film. Decals had to be found in the spares box. The roundels were made by combining 2 decals. The model was finished as usual. 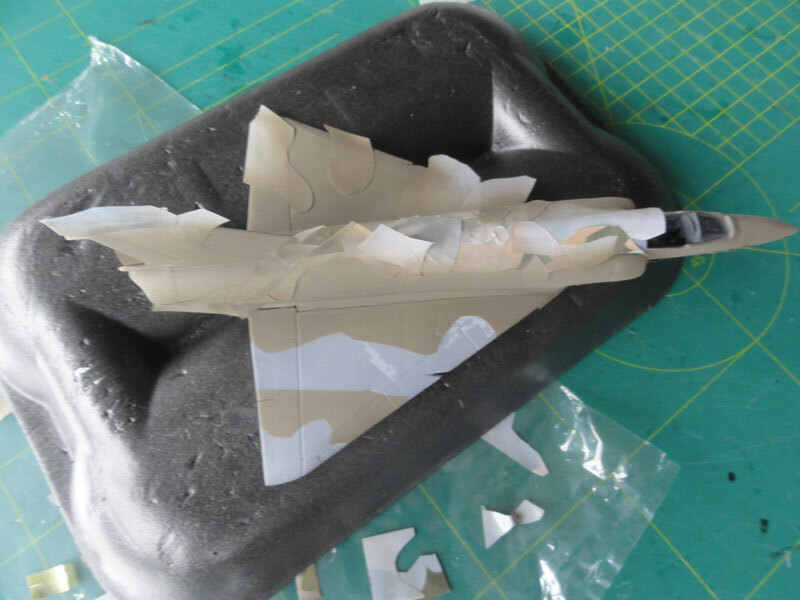 The smaller parts like undercarriage was added as well as tinier parts like the pitot tube (made from a metal needle) but also for example mirrors in the canopy. The final coat was a semi-gloss one with the usual technique. With the canopy installed, that completed the model. The Gabon air force "Forces Aeriennes Gabonaises" was established with French assistance. It flew with Magisters, a Fokker F28, EMB 110 and Alouette II helicopter. 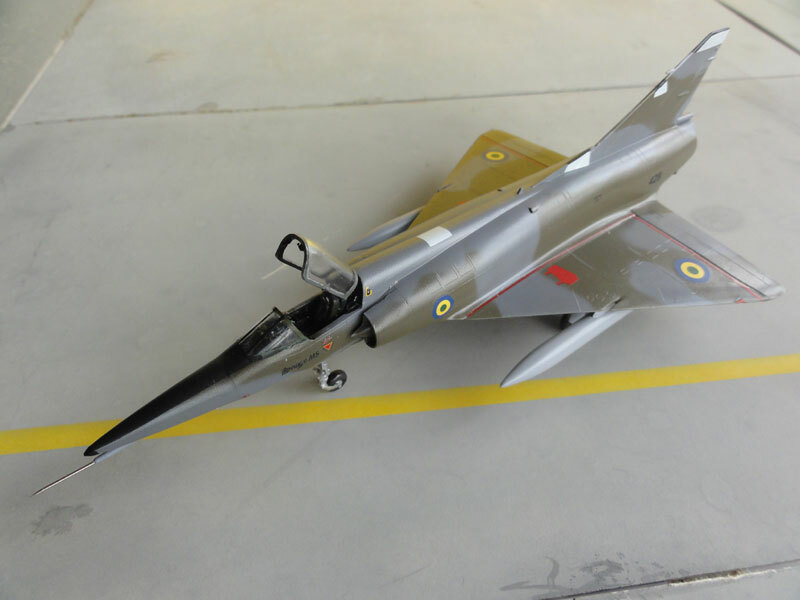 The fleet is small and operates as fighters some 6 Mirage F-1AZ and also some MB-326 and a few Mirage 5 jets. Transports are a C-130, Gulfstream GIII, an ATR-42 and a CN-235. Also some 4 T-34 trainers are used. Also some helicopters are used. Bases are at BA01 Libreville, BA02 Franceville and Tchibanga. The army also flies with several helicopters like Puma and Gazelle and there is also a Presidential Flight. Gabon Air Force / "Force Aerienne Gabonaise" Mirage 5G. About 5 aircraft were delivered by Dassault in 1978 with some additional 4 upgraded 5G-2 aircraft in 1984. They were used primarily from BA 02 at Franceville/ M'Vengue in Gabon.